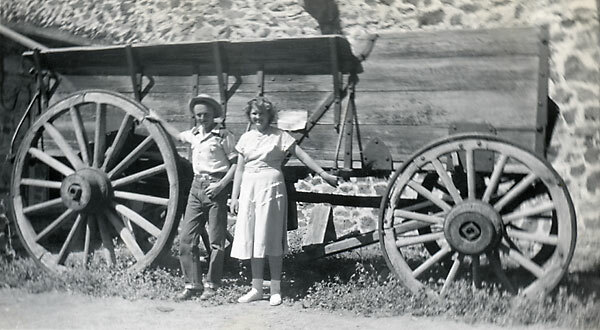 The wagon was one of the first and most essential pieces of equipment necessary for homesteading and operating a farm. Light wagons and buggies were used to transport people and supplies. Medium wagons were used for hauling everything from manure to potatos. And heavy wagons were used for hauling rocks, coal, ore, and other commercial products. The versatility of the wagon is illustrated by the wagons in the picture above. The wagon box has been removed from these wagons so that just the wagon frame can be used to haul long poles down from the mountains. When our Morgan/Radford ancestors moved from Utah to Idaho or Wyoming they packed everything in the ever useful and versatile farm wagons, covered them with tarps, and lived out of the wagons while they traveled. In bad weather they either slept in the wagons or under them. When our ancestors moved to Wyoming in 1888 there were already trains running between the major cities in Utah and Idaho but farmers didn't have enough money to put everything on trains. They moved in Wagons. 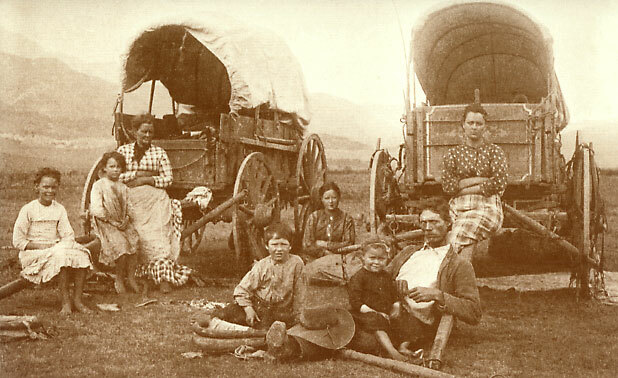 In the picture above is the J. H. Byington family in front of their farm wagons which have been converted to covered wagons for travel. This picture was taken in Utah in 1870 by Henry Martineau. The people in the picture are, left to right: Sarah Augusta Byington, age 11, Elizabeth Ann Byington, age 6, Nancy Marie Avery Byington (1st wife) age 37, Nancy Maranda Byington Stokes, age 17 (sitting between wagons), Hannah Molland Byington (wife #2), age 30 (sitting on the wagon), Hyrum Elliott Byington, age 8, Janette Sophia Byington, age 2, and Joseph Henry Byington age 39. Click on the link above to see a picture of a medium duty utilitarian farm wagon. Literally every farm family would have owned one or more wagons of this size. The era of the wagon passed quickly in America. Thomas Morgan (1821-1915) and his generation would have spent most of thier lives driving wagons, but even Thomas lived to ferry the newly arrived cars over the Snake River on his ferry. 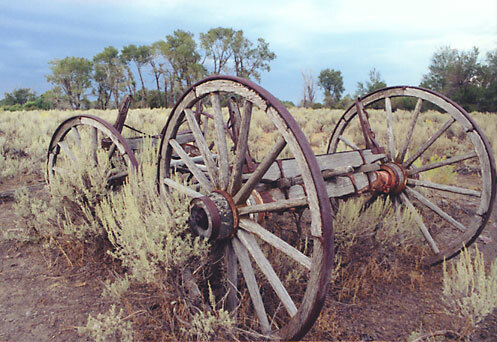 Today the wagon is melting into the background, kept alive only by wagon wheels placed as decorations in people's front yards, a few wagon afictionados who rebuild and drive them at horse shows, and the Hollywood cowboy movies.The wagon, once an absolute essential in every farmers life, has passed quickly into history.